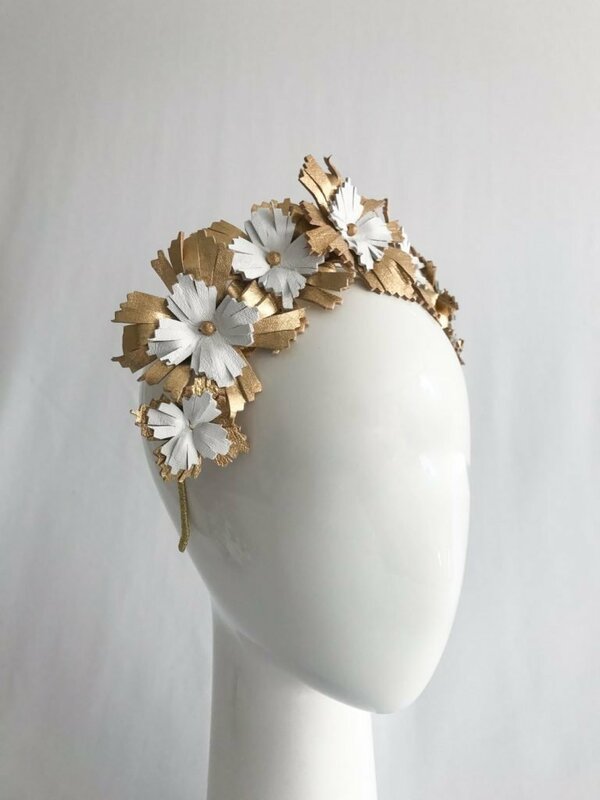 We do a rental service for all our headpieces ranging from €40 – €60 for 3-4 days. We DHL all over the world or you can collect in store. 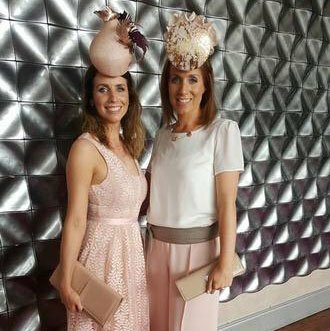 If you’re unsure which headpiece to choose please feel free to give us a call on 045 871333 or message us here. With a keen eye for detail and using the finest materials, these headpieces are all handmade to an exceptional quality by Galway milliners Design by Shimmer. 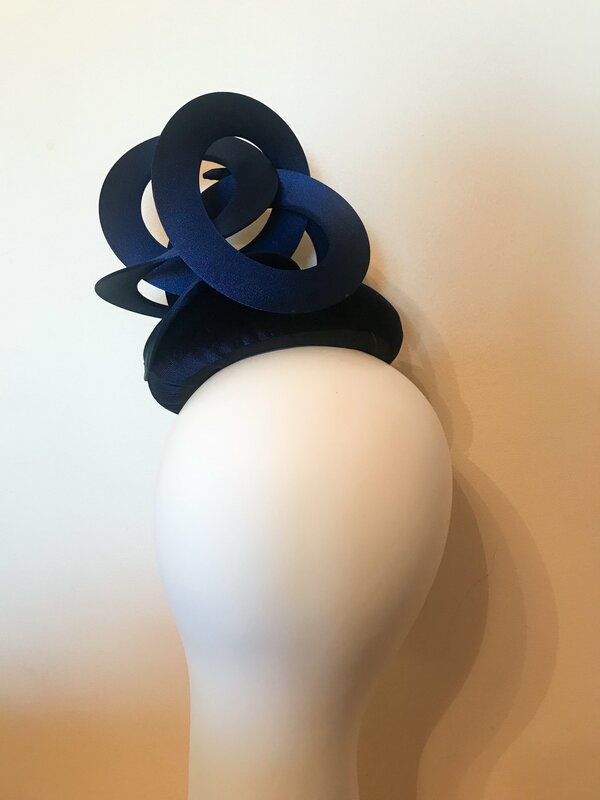 These luxury hats, headpieces and crowns are perfect for a day at the races or attending a wedding. Hand made Gold and white leather crown, each individual flower is wired allowing the wearer to manipulate it to achieve their desired look. 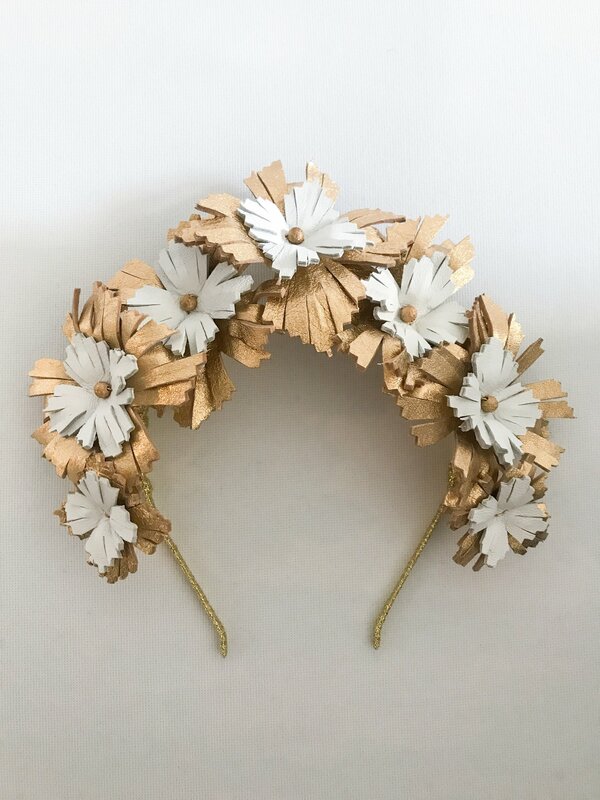 Works really well for a boho look with soft curls or an up style with some hair escaping. 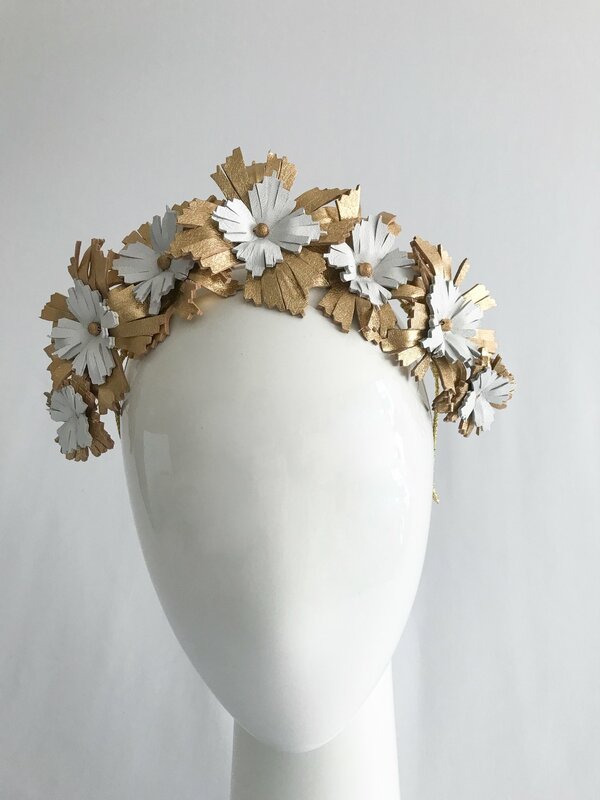 This beautiful headpiece can also be worn to achieve a more unusual quirky look depending on how its styled. 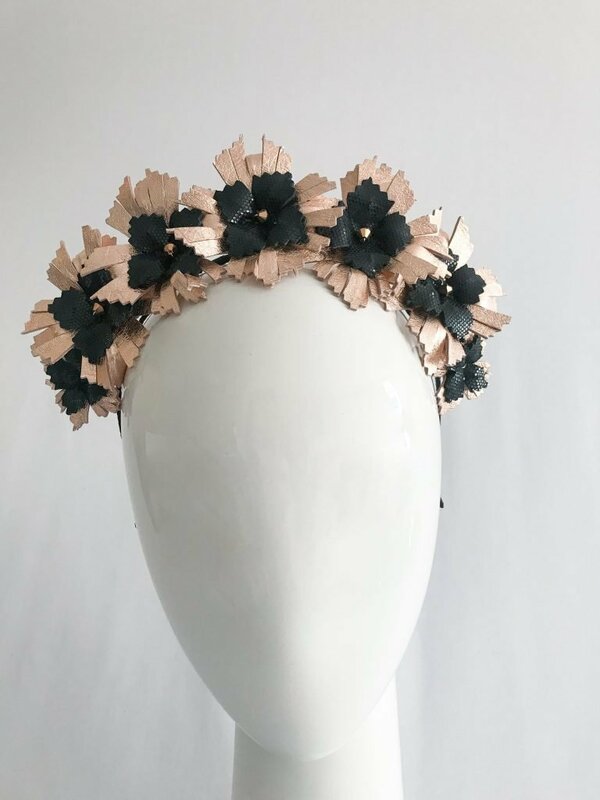 Hand made rose gold and disco black leather crown, each individual flower is wired allowing the wearer to manipulate it to achieve their desired look. Works really well for a boho look with soft curls or an up style with some hair escaping. 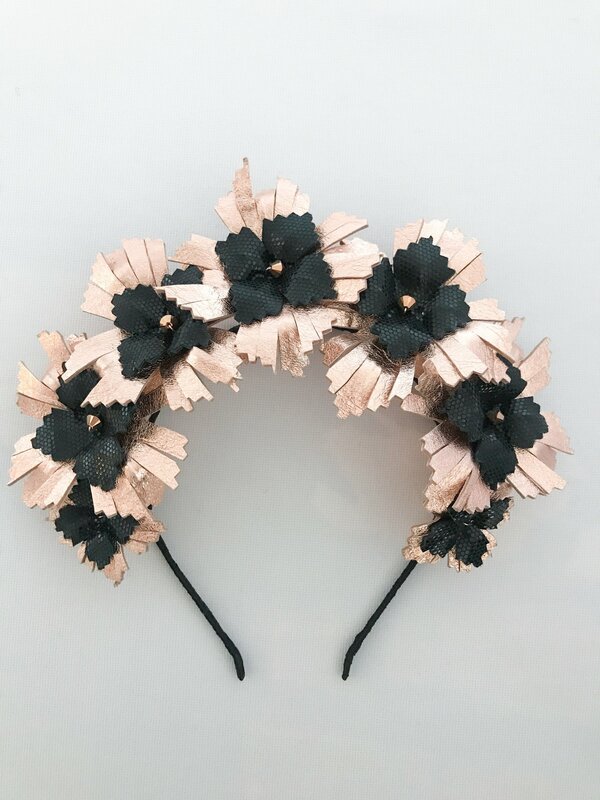 This beautiful headpiece can also be worn to achieve a more unusual quirky look depending on how its styled. 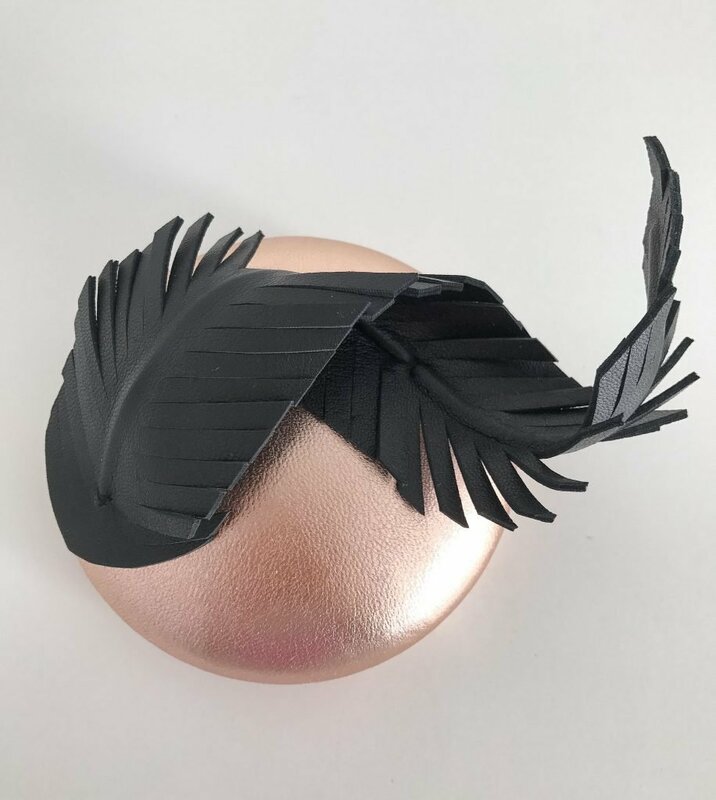 Hand made rose gold leather button headpiece with single handmade blush pink leather feather. 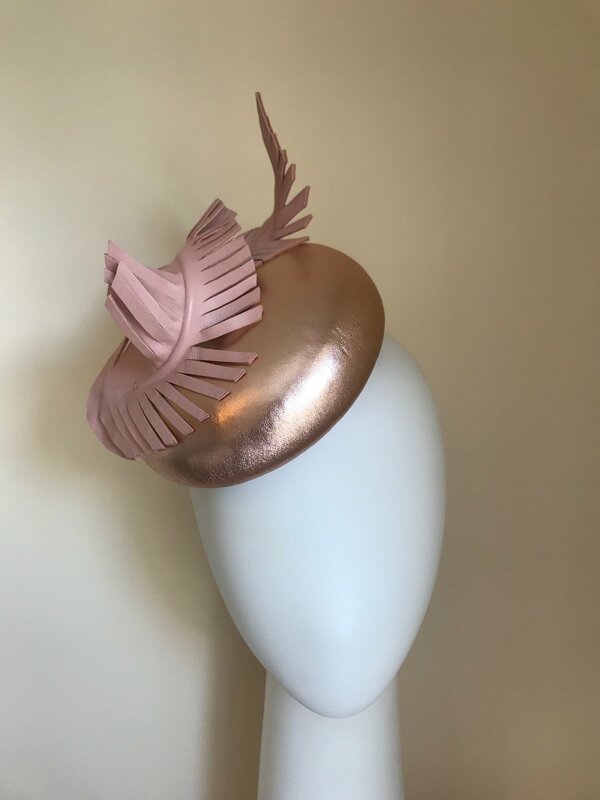 This is a great and very versatile headpiece the rose gold and blush are fresh and feminine and compliment most colours. 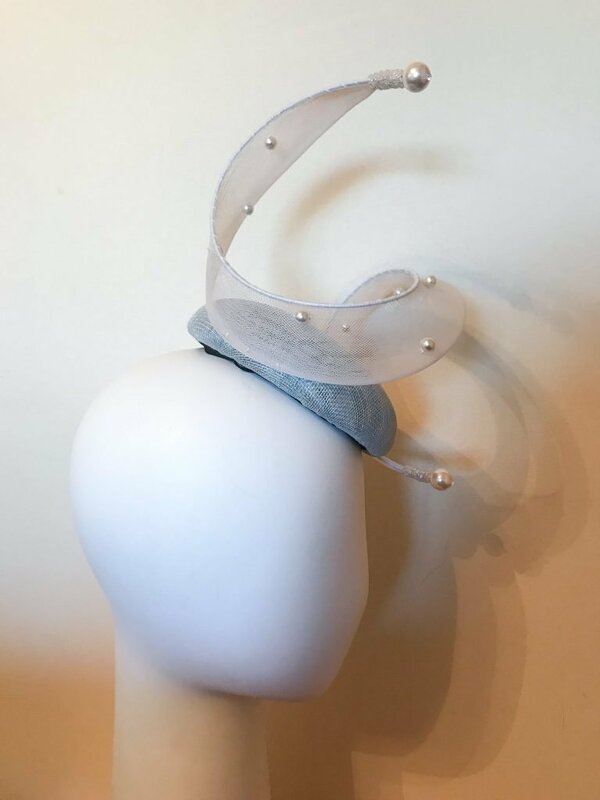 This piece uses an elastic to fix on the head and is very secure and comfortable to wear. 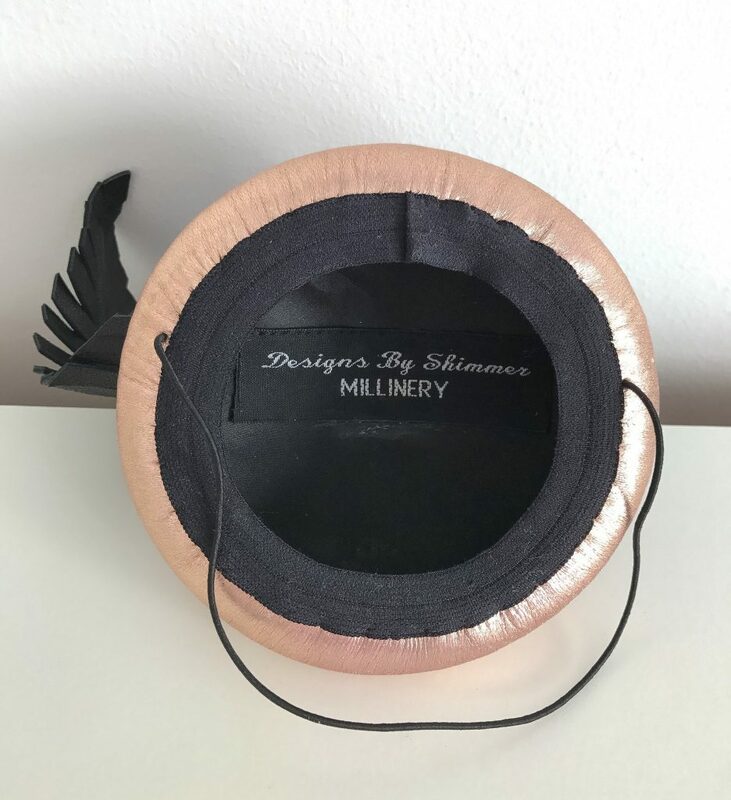 Best worn titled to the side of the head resting just above the eyebrow for a dramatic look. 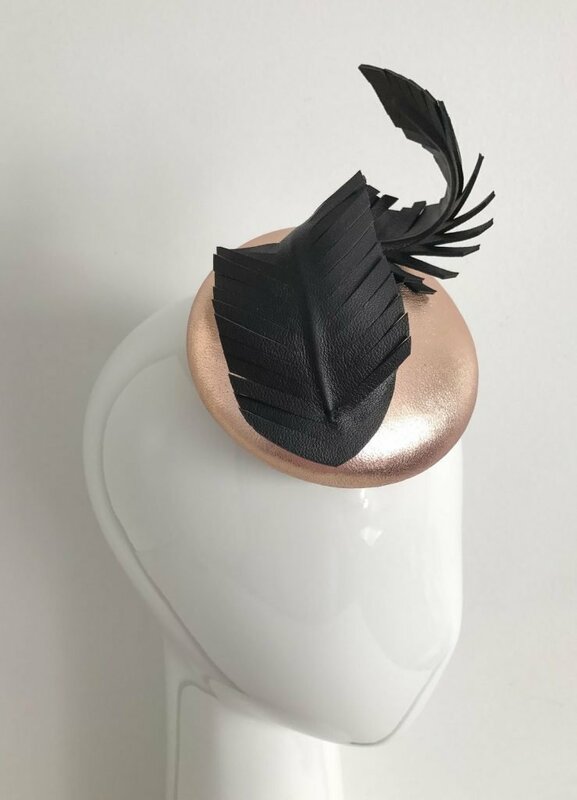 Hand made rose gold leather button headpiece with single handmade black leather feather. 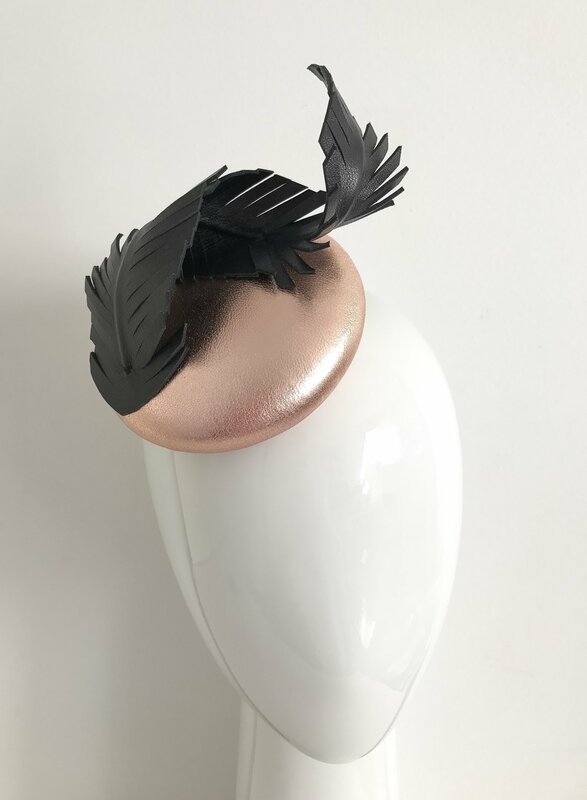 This is a great and very versatile headpiece, the rose gold is a warm tone and compliments most colours along with the dramatic black. 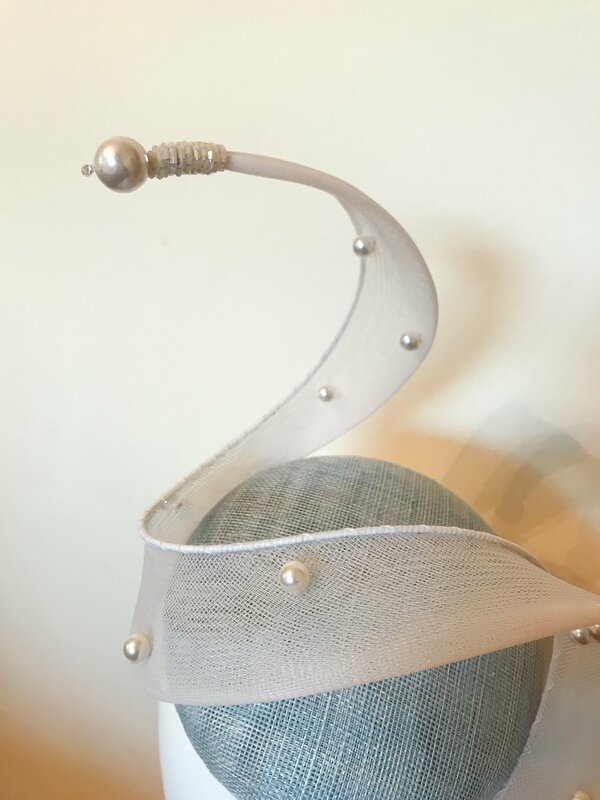 This is a small neat headpiece which uses an elastic to fix on the head and is very secure and comfortable to wear. Best worn titled to the side of the head resting just above the eyebrow. 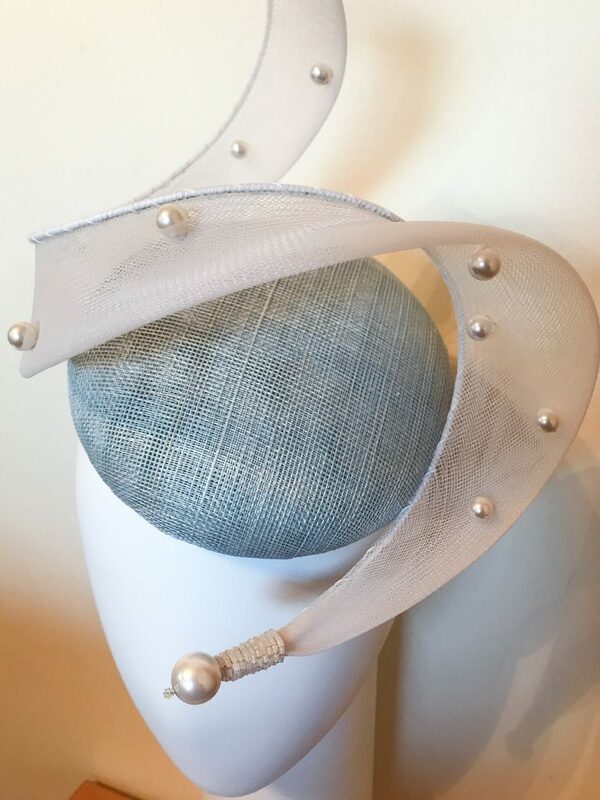 Beautifully crafted pale blue base topped with a single swirl hand beaded with Swarovski pearls. Combined the delicate blue hues going through this piece with the gleam from the pearl are an elegant statement. 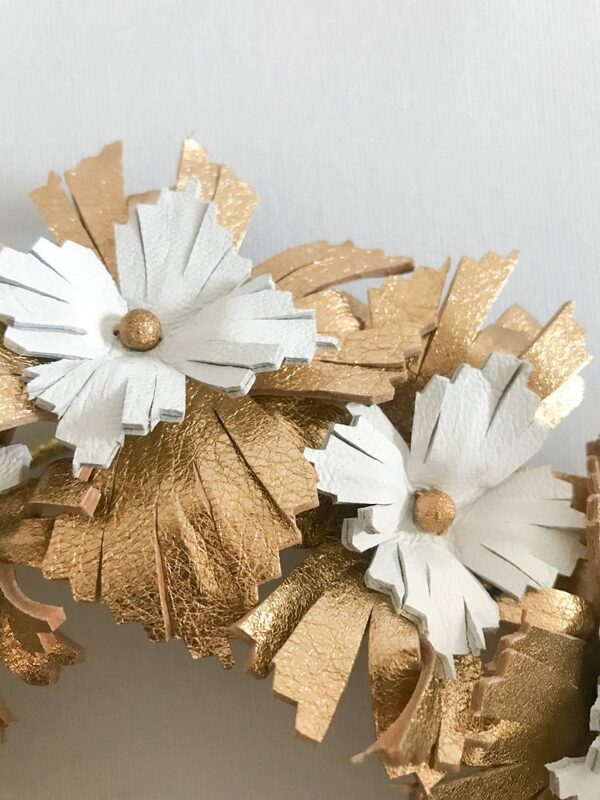 Can be worn with similar tones, many other delicate colours and can also compliment navy very well. 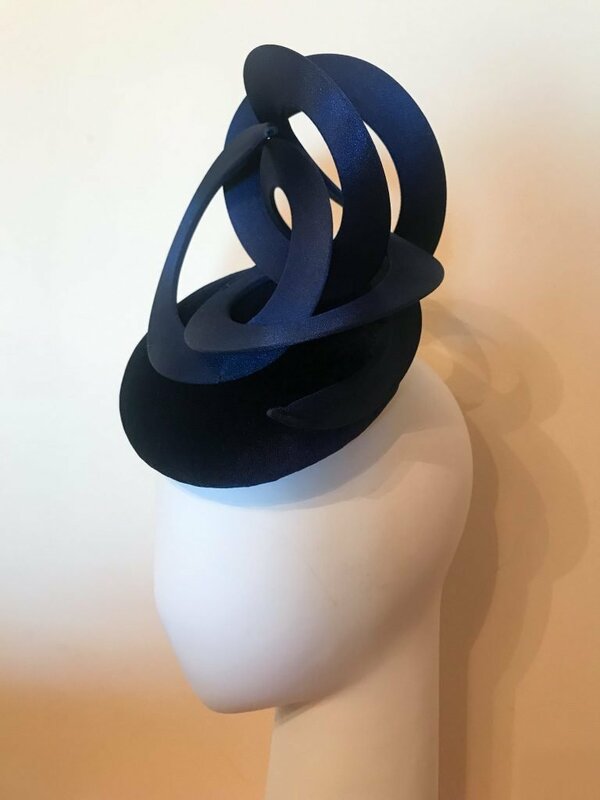 This piece uses an elastic to fix on the head and is very secure and comfortable to wear. Best worn titled to the side of the head resting just above the eyebrow for a dramatic look. 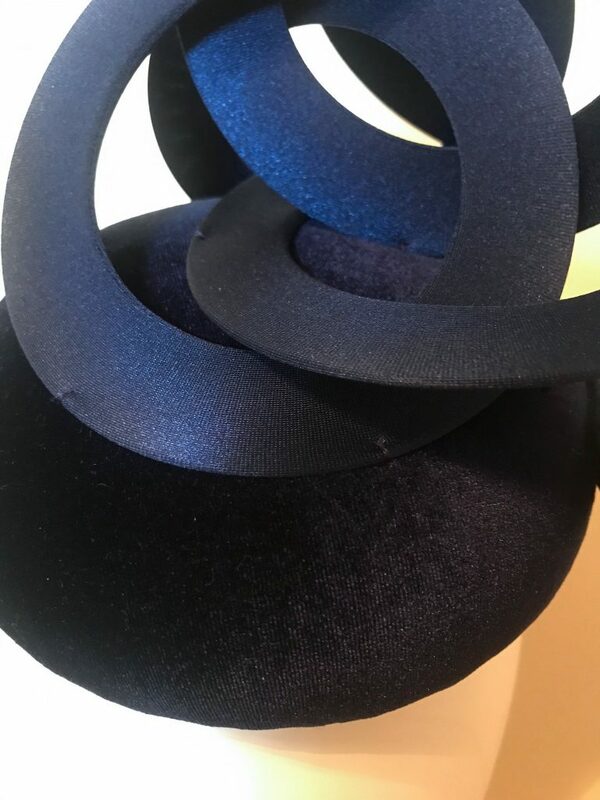 This headpiece is crafted with a very plush navy velvet, topped with handmade navy swirls. 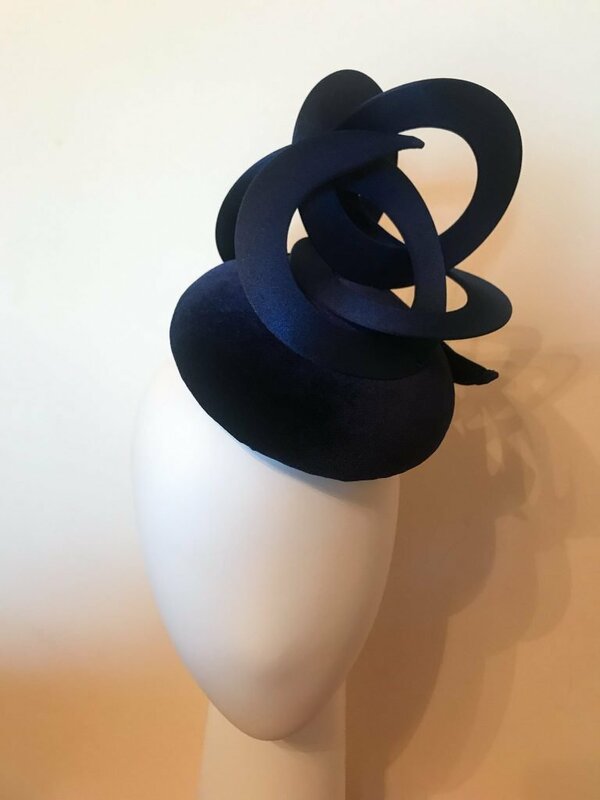 This is a favourite of our customers as the rich navy compliments many other colours, looks especially well worn with hair up for a very classic style. 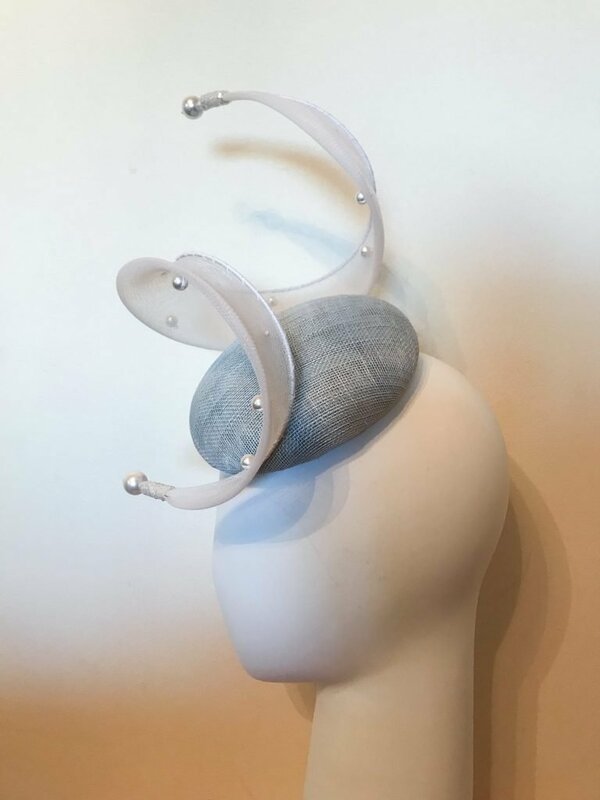 This piece uses an elastic to fix on the head and is very secure and comfortable to wear. Best worn titled to the side of the head resting just above the eyebrow for a dramatic look.